Biblical creationists have maintained that the earth is thousands of years old, not billions, and creation scientists are repeatedly shown to be right. Oceanic salinity fails uniformitarian assumptions, and new research regarding the volume of ocean water menaces deep time beliefs as well. If you venture toward Micronesia, look for an archipelago there called the Mariana Islands. They have themselves a nice trench there, and the deepest point could easily cover Mt. Everest! The continental plates are moving along, and when one hits another, one of the plates subducts (gets pushed under) another. Some researchers decided the very deep blue sea was a good place to check out subduction. What they found is that water is being subducted below the crust of the earth into the mantle. Lots of it. Once again, secular scientists are saying things along the lines of, "More than we expected". The whole shebang causes problems with the geological record. Time to rewrite uniformitarian history again. Of course, this research indicates not only a young earth, but supports creation science models of the Genesis Flood. Secular science believes Earth’s oceans have existed for about four billion years. They also think the level of the ocean has remained about the same over that vast period of time. However, a new study published in Nature creates serious problems for the uniformitarian origin of our oceans and their long-term sustainability. Chen Cai and his colleagues from Washington University in St. Louis found that the global water flux into the mantle was three times greater than previously estimated. 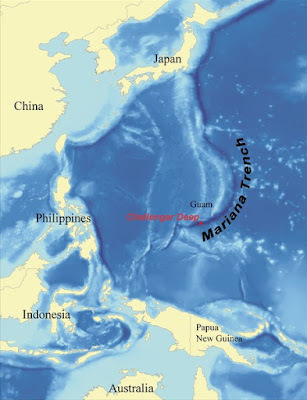 The researchers used ocean-bottom seismographs near the deep Mariana Trench in the western Pacific Ocean. The team estimated the volume of water trapped in rocks that were being dragged down into the mantle by subduction. By studying changes in the velocity of shear waves generated by earthquakes, the scientists were able to calculate the volume of water trapped in rocks both before and after subduction. To finish reading, click on "Mantle Water Flux Indicates a Young Ocean".